We have some tiaras in action for our review on this Thursday: King Felipe and Queen Letizia kicked off their state visit to Japan with both tiara glitter and earring glitter. Letizia's Felipe Varela outfit for the official welcome ceremony was a deep red velvet dress with a whole lot of buttons and a neck bow worn under a red coat with waist detailing and a double tie closure. That's an awful lot of fastening methods for one outfit. Doesn't really matter, though, because her earrings drew all the attention anyway. That's right, our resident Earring Queen delivered in a major way. In addition to a potentially interesting pair from Bounkit in green jade and rose quartz worn for a later reception (which you can spy in this gallery), Letizia's red outfit included a pair of diamond and ruby earrings belonging to a set of jewelry previously worn by Queen Sofia. Not only do I love a little extra dazzle on a special state visit outfit, I love Letizia wearing gems from Sofia's collection. The Sofia earring trend continued at the evening's state banquet. Returning to her recent favorite tiara, the Spanish Floral Tiara, Letizia wore the two large bracelets from the "joyas de pasar" (recently debuted when she wore the Fleur de Lys Tiara) and borrowed diamond and sapphire earrings once again previously worn by Queen Sofia. This dress could take the necklace, too, not to scare her off the jewel path or anything. Empress Michiko got her carats in with a large diamond collet necklace and pendant, having stopped wearing tiaras a few years ago. Lest you were in any doubt from the above picture, yes, this is THE Princess Dress (queen dress, but whatever) from the 2015 Peru state banquet. And lest you should be in any doubt in any situation, yes, Empress Michiko has worked a little bit of cape action into her look. Shall we do a Sash Check? 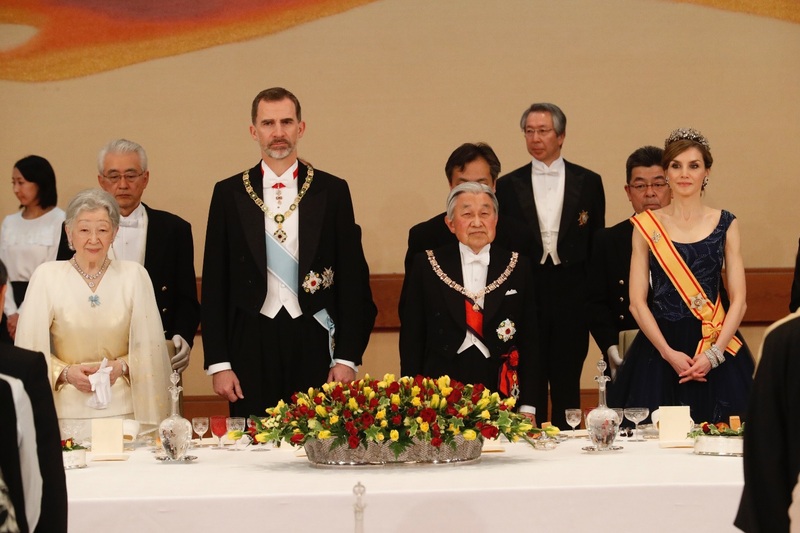 For the curious: King Felipe wore the collar of Japan's Order of the Chrysanthemum, while Emperor Akihito wore the collar of Spain's Order of the Golden Fleece. Both displaying peak methods of combining orders from another country plus one's own country, Felipe also wore the Order of the Golden Fleece around his neck and the sash of the Order of Charles III (with double breast stars on his jacket); Akihito also wore the sash of the Order of the Chrysanthemum. Queen Letizia was given Japan's Order of the Precious Crown. (Fun fact: she was also gifted silk from Empress Michiko's own silkworms, enough to make a dress.) The Empress chose to wear the small bow brooch of the Order of Charles III on her bodice instead of the sash, which she has worn in the past. There are always more tiaras when Japan is involved, it's often just a little harder to see them. 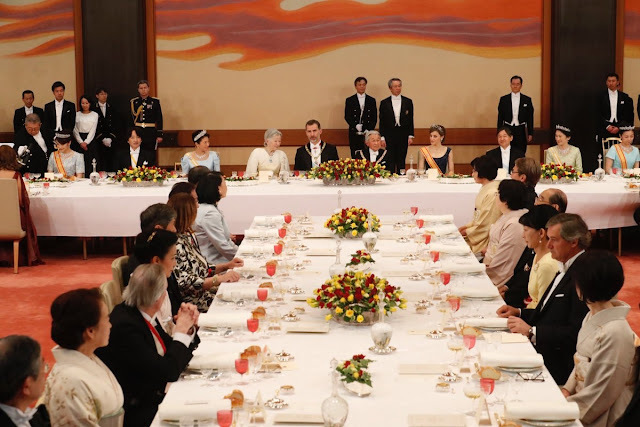 Above (click to enlarge) we have Princess Mako in her tiara, Crown Princess Masako with an interesting sleeve detail and the Japanese Pearl Sunburst Tiara, Princess Kiko in the Akishino Tiara, and Princess Kako in her tiara. (There are a couple better views of some of the Japanese princesses in this gallery, and you can see more walking behind the main table in this video.) A most satisfying sparkly show, no?